The Doctor (Matt Smith) pays us all a visit in between seasons in this year's Doctor Who Christmas special. While America doesn't have the Christmas Day television culture that the British have (we tend to hit the movie theaters after dinner instead), the former colonies does have its share of 'Doctor Who' fans. With impatient folks wanting their 'Who' spoiler-free and as soon as their British cousins get a new episode, it makes sense that BBC America would air the newest Doctor Who Christmas special on the same day as it aired overseas. Also, if BBC America wants to retain viewers and not lose them to bittorrenting, this should become a regular practice, particularly when the next season kicks in. One thing is for sure, this is the most 'Christmasy' of the specials since they began with "The Christmas Invasion" back in 2005. "A Christmas Carol" is a big wet mouth-kiss to the original Dickens classic. Well, a new Doctor and a new show runner, so things are bound to be as different with these standalone shows as the last season was in comparison to the ones preceding it. 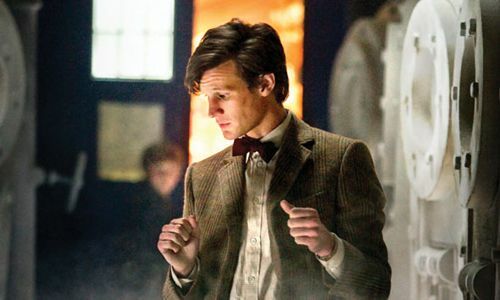 I have loved Matt Smith as the Doctor. Of the three modern incarnations, he has been by far my favorite. David Tennant was good, but he was also very over the top at times. Manic even. Smith can be fun and off the rails, but in a more convincingly focused way. Also, he does 'sincere' incredibly well and has masterfully convinced me that that this is a very old man in a young man's body. The guest appearances by Amy Pond (the always lovely Karen Gillen) and her new hubby, Rory Williams (Arthur Darvill, who finally got his name into the opening credits) was fun. Having them in their respective Police lady and Roman Centurion outfits was a fun acknowledgment of what had come before, but an indication as to what passes for entertainment in the Pond-Williams honeymoon suite. That's one thing I've loved about the modern era of 'Doctor Who'; it is at its core a children's show, but the writers take a few opportunities to slide in a nudge and a wink to the grown ups. Still, the Doctor's companions rarely join him on his holiday adventure, allowing the BBC to hook him up with a higher profile guest. In years, past he was joined by comedienne Catherine Tate (who eventually became a companion) and singer Kylie Minogue. This go-a-round, the Doctor teams up with Dumbledore himself, Michael Gambon, as the Scrooge analogue, Kazran Sardick. Also to add some spice, we are treated to the lovely Welsh siren, Katherine Jenkins as Abigail Pettigrew. Basically, Kazran is a grumpy, spiteful man that controls the skies of his world. Incidentally, Amy and Rory's honeymoon spaceliner is careening towards said planet and it would help if Kazran could clear the skies up for their landing. The Doctor attempts to make Kazran a nicer person by going back into the past and helping him as a boy enjoy Christmas. This leads to Kazran's meeting with the frozen Abigail who can only join them one day a year before returning to her chamber. What's fun about this particular adventure, is that we get an example of the Doctor trying so hard at achieving a goal, that he inadvertently makes things just as bad or worse, before saving the day. Here he helps a young Kazran fall in love with Abigail, only to learn that she is terminally ill and only has one day left. This reinforces Kazran's miserly tendencies, causing him to save her a way for that perfect day that will never come. It all becomes sad, tragic, and eventually inspirational. All very 'Doctor Who'. In all, not a bad way to spend a Christmas evening. We were also treated to trailer full of rapid images as a preview to the 2011 season of 'Doctor Who'. It can't get here soon enough and hopefully, BBC America will be able to broadcast the upcoming sixth season of the show the same evening as the initial airing in the east.